OUTMemphis is joining with SAGE to host one of hundreds of community potlucks all over America for LGBT elders and allies of all ages! Join us at OUTMemphis on Thursday, 11/8 from 6:00p-8:00p. Bring a dish and meet some new friends! We’ll talk about OUTMemphis social events and services for LGBTQ seniors, the current federal actions targeting LGBTQ seniors (and what we can do about them), and, most importantly, we’ll get to know each other better. 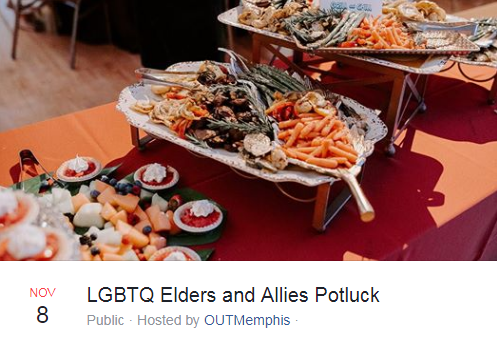 Click here to see the OUTMemphis Elders and Allies Potluck event. To learn more about Senior Services at OUTMemphis, click here.